*All opinions are a 100% my own. No compensation was provided. potty training at home, you can't suddenly stop because you're out of town, or even out for the day. Consistency is key, or your child will go back to the easy way of going in the diaper right away. Recently at Blogger Bash's Baby Palooza event I got the opportunity to take home the 2in1 Potette Plus to try, and I wanted to share it with you guys right away. The 2in1 Potette Plus is a trainer seat, and travel potty in one. The little package comes with a children's book "Quest for Cloud Kingdom A Petey Potette Training Tale", 2in1 Potette Plus Set, and Mr. Petey Potette Training Companion. When you are potty training your little one, you want to be consistent, and when your child has learned to tell you she needs to go, you need to take her to the bathroom. If your child is learning, she also needs to be comfortable to go as well - which is why holding your child over a random toilet doesn't always work. The trainer seat securely fits most standard toilets seats, and the same seat turns into a travel potty by easily folding handles into place for a full size potty. It comes with a plastic travel bag, and 3 super-absorbent 100% biodegradable liners - which you can purchase more of. You turn the potty seat into a potty and line it with the the liners, it holds up to 5 ounces of liquid. The liners are also lightly scented to absorb odors. I have never previously seen or used the Potette myself, but met a couple of moms at Baby Palooza that raved about how great it was when they needed it for their little one. Testing it out both as a trainer seat and portable potty has worked so well for us. Reading the book, handing my daughter the little Mr. Potette companion, and using the seat has been exciting for her. She is now successfully transferring from her potty in the bathroom to on the toilet with this training seat and this was the perfect timing for us to test out the potty training seat. We like to travel and other training seats have always been so big to take with us, but luckily the Potette, once placed in a clean plastic bag can even fit in a large purse. I think it is especially going to come in handy for little girls on the go. I love how it is a efficient 2in1, and the small space it takes up. The little companion is such an adorable idea, hand it to your child only when it's time to use the potty or potty seat and you've got a good routine going, and they're never alone. 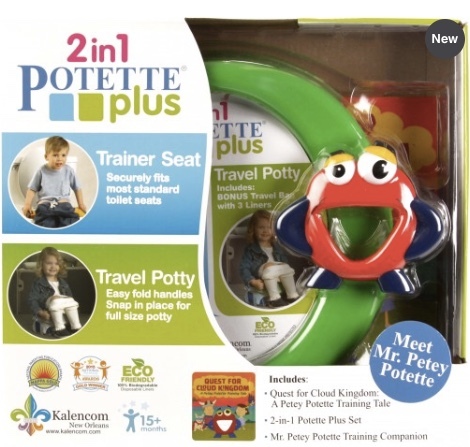 My youngest is 15 months old now, and it won't be long until I have to start potty training him, I'm glad I got Mr. Petey Potette and this cool set to help me potty train successfully by keeping a consistent routine.